CHS Students and Staff – Next week on Monday, February 9th Dorian Photography will be here taking all CHS Club and Organization group photos during the day in the theater. The schedule and group rosters will be posted with the bulletin on the website, as well as around the building to prepare for the day. Groups will be scheduled every 10 minutes starting at 10 AM throughout the day. Here is a link to the Club Rosters in a pdf format posted on-line. 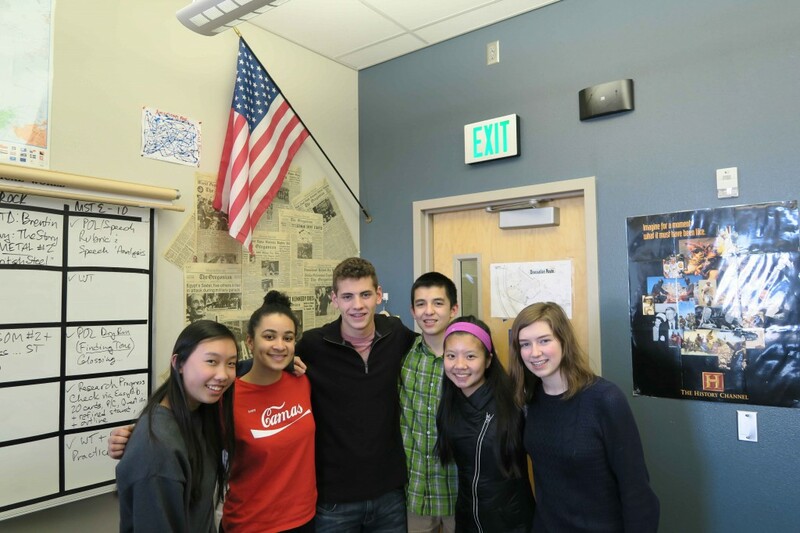 The Camas High School Knowledge Bowl team is blessed with an abundance of talent. Of particular merit this season, however, has been one of our Junior Varsity teams that is currently ranked 1st out of 42 JV teams in the Region. JV#4, comprised of all sophomores and one freshmen, posted the highest score of any team, JV or Varsity, an impressive 101, at the Wednesday, January 13th meet, at Union High School. Roll on, Papermakers! Camas Knowledge Bowl was victorious on Wednesday, besting the Titans of Union and others from the League in our 3rd Round Robin tournament of the year. See the results below. A special shout out to Camas Varsity #3 and JV #4 who ruled the pack. By the way, JV#4, a team of mostly sophomores and one freshman, had the highest score of any team, Varsity or JV, coming in at 101. Bravo! In the Region, Camas Varsity (comprised of 5 teams) continues to place in the top 7 of 42 teams. And Camas JV (5 teams, too) is still unparalleled in its dominance Regionally and in League. We are currently ranked 1-5 out of 42 in our Region, and 1-5 out of 15 teams in League. Our next meet is Wednesday, February 4th, 2015, at Columbia Adventist Academy in Battle Ground, WA. CHS Knowledge Bowl traversed the Gorge last night to compete in the 2nd meet of the season at White Salmon. We did very well. On the Varsity side of things, Camas #3 edged its arch nemesis Union #1 by one point to take top honors in the varsity competition. Camas #3 is anchored by seniors Jonathan Ho, Yun Teng, Lizzy Nickerson, junior Colton Ratcliffe, and sophomore Jason Kim. Congratulations Camas #3! Junior Varsity had a clean sweep of the competition, with our 5 JV teams taking 1st through 5th out of 15 total JV teams at the meet. JV#1, comprised of freshmen Jesse Lester, Daniel Fan, Sarah Well-Moran, Lindsay Leetham, Alex Neal, and sophomore Aubrey Johnson, were dominant with a score of 89. The next closest non-Camas JV team was Union, who earned 54 points. Congrats, JV#1 and all the JV teams for getting out the brooms in this clean sweep. I’ve attached the league standings for your perusal. It’s worth noting that Camas JV currently has the top 5 spots in our JV league out of 42 total teams. Our region ranges from Longview in the north, Iwaco in the west, to White Salmon in the east. Well done! Finally, my apologies for our late arrival last night. We had some equipment issues in one of our rooms that delayed the end of the meet. Instead of getting on the bus around 5:30 in White Salmon as planned and like normal, it was closer to 6:15 before we were able to depart. Thanks for your understanding and patience. I hope the kids kept you apprised of our arrival time back at CHS as I reminded them to do so. Our next meet is Wednesday, January 14th, at Union High School.